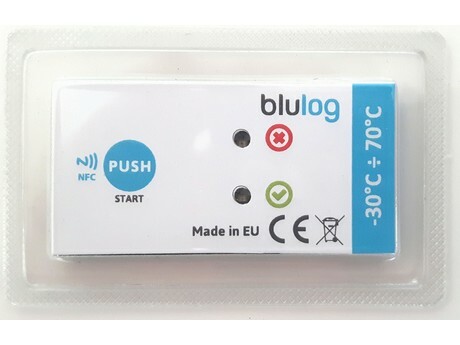 Polish-French venture, blulog, has developed a new temperature monitoring solution, dedicated especially for food retailers. The solution is composed of RF+NFC loggers that sends up to 44 measurements once it is connected to the hub. "We wanted to create a solution that would provide players in the food and pharma industry with real-time temperature data, making them proactive in managing food waste, and making it possible for them to react before incorrect temperatures create losses. Previously, the available solutions were either too expensive or too complicated and time-consuming. Our system enable this in an easy and affordable way," shares Daria Roszczyk-Krowicka from blulog. "Thanks to our devices, users can not only quickly and remotely access temperature data, but also make immediate decisions on the data they receive. The sender can also be notified of the reception of goods by the receiver. Another important benefit is linked to savings in time - there is no longer the need to manually check the temperature, which is an obligation for food retailers or restaurants. This last point in particular explains why we are in the process of equipping many of the leading food retailers in Europe as well as many restaurants." 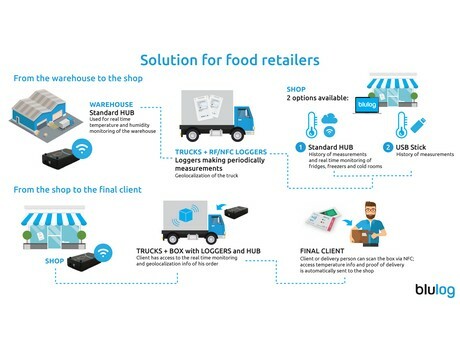 Hubs are installed in warehouses and shops - which enables real-time monitoring of freezers, cold rooms or fridges at all times. Moreover, there are loggers installed in the truck transporting perishable goods. When the truck arrives at the shop, loggers connect to the hub installed and sends the history of measurements. This means that there is not only access to the temperature data, but it also acts as a proof of delivery because it is registered when the truck arrives at its destination. The other option is to have loggers and a hub installed in the truck, or integrated into the boxes. When a hub is installed in the driver's cabin, loggers transmit data which is then sent to the cloud to enable realtime monitoring. At the moment of delivery, the transporting agent or the final client can scan the logger using his NFC-enable smartphone or a special reader. The temperature report is then automatically sent to the sender and can be treated as a proof of delivery. "What makes our solutions unique on the market is the unique ratio we have between functionalities, ease of use and cost: we can provide real-time monitoring on a tiny credit-card size device with multiple year autonomy, long range and all this at a very affordable price. Thanks to their small size and ease of use, our solutions can be directly integrated into isothermal boxes. We are also the only company to provide RF+NFC loggers. The combination of two technologies allows both local and remote access to the temperature and a possibility to get the data even if there is no Internet connection. Our RF solution is also very scalable -you can have 10,000 tags communicating to the same gateway at the same time."